Freshman Jacob Nave tees off in the first golf match of the 2011 season. 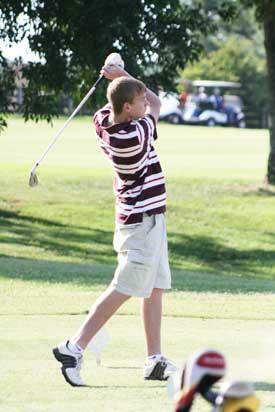 The first match of the 2011 season for the CCHS Golf Team was played Tuesday, August 2. The team traveled to Southern Hills Golf and Country Club in Cookeville to tee off against the teams from Upperman, York and Gordonsville. CCHS has only one returning player from last year, so the young team had a big job ahead of them. Disregarding the heat, the CCHS team drove to a second place finish with a team score of 192. Upperman placed first while York and Gordonsville placed third and fourth respectively. CCHS's next match is scheduled at their home course (Willowbrook) for (today) Thursday, August 4 against Dekalb Co.
Next week will find them at Smith Co. on Monday, August 8, and home against Upperman on Thursday, August 11.